Provides information about interactive form field that defines check box. A check box field represents one or more check boxes that toggle between two states, on and off, when manipulated by the user with the mouse or keyboard. Each state can have a separate appearance, which is defined by an appearance stream in the appearances of the field's widget annotation. The appearance for the off state is optional but, if present, must be stored in the appearance dictionary under the name "Off". The recommended (but not required) name for the on state is "Yes". 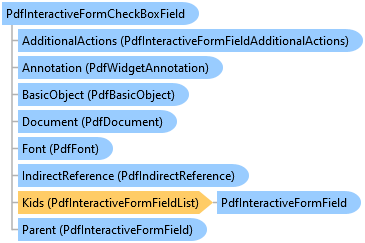 To change value of the field, use property PdfInteractiveFormSwitchableButtonField.Value. To change default value of the field, use property PdfInteractiveFormSwitchableButtonField.DefaultValue.